The Nutter Real Estate and Finance Group ended 2015 with a series of closings representing buyers, sellers, borrowers and lenders in commercial real estate transactions totaling more than $1 billion in aggregate value in December alone. The Nutter Real Estate Bulletin is a periodic update that highlights recent client transactions for which we have been pleased to serve as legal counsel. For further information, please contact your Nutter attorney. Nutter client Related Beal, an affiliate of Related Companies, marked the start of a $230 million mixed-use development, Parcel 1B, in a groundbreaking ceremony attended by Charlie Baker, Governor of Massachusetts; Marty Walsh, Mayor of Boston; and other luminaries on February 4, 2016. Nutter represented Related Beal on a range of complex issues, including title, acquisition, zoning, and environmental matters as well as state and City of Boston entitlements, real estate tax stabilization, and hotel financing. Nutter also negotiated the development rights and the air rights lease which was signed in December of 2015 with the Massachusetts Department of Transportation. 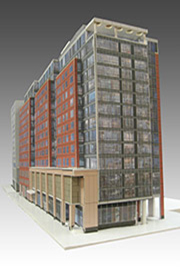 Parcel 1B is a mixed-use project in the North Station area of Boston. It is the first large-scale 100 percent affordable and workforce housing development in downtown Boston in the past 25 years. The project will include a large-scale residential development exclusively offering below-market rental rates as well as a 220-room hotel, ground floor retail space, and parking. Nutter provided legal counsel to Tedeschi Food Shops, Inc., a family-owned business and leading regional convenience retailing and foodservice company, in the sale of its business to 7-Eleven, Inc. The 7-Eleven transaction was a significant milestone for one of the most trusted family-owned businesses in New England. This complex transaction resulted in Tedeschi's 181 markets, located in Massachusetts and New Hampshire, becoming part of 7-Eleven's chain of 10,500 stores in North America. Adding to the complexity of the transaction was the fact that many of the sites were leased to Tedeschi, many were franchised to other operators, and 15 of the sites included the sale of motor fuel. Nutter is proud of its long relationship representing Tedeschi family businesses on their significant transactions, including the 2002 acquisition of the 80-store Store 24 chain and the $377 million sale of 25 grocery-anchored shopping centers in 2007. MAPFRE Commerce Insurance Co., the largest insurance company in Massachusetts, engaged Nutter to assist it to negotiate and conduct due diligence review in connection with its recent purchase of One Winthrop Square, a coveted "jewel box" building in Boston's Financial District esteemed for its 19th century detailing. One Winthrop Square served as the headquarters of the Record American newspaper (a predecessor to the Boston Herald) and was part of Boston's famous "Newspaper Row." 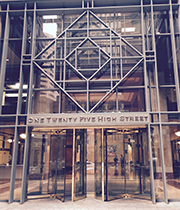 Nutter assisted global learning company Houghton Mifflin Harcourt (HMH) in the negotiation of the largest office lease transaction in Boston in 2015: the relocation of HMH's Boston headquarters from the Back Bay to the premier downtown building at 125 High Street in Boston, adjacent to the Rose Kennedy Greenway. The long-term lease (through April 30, 2033) involves nearly 200,000 rentable square feet, including prominent ground floor space for marketing and display of HMH's content and digital solutions.